The signs of the zodiac are shown in the innermost wheel. 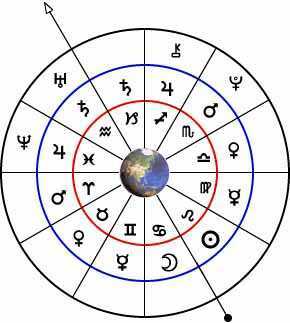 Their traditional planetary rulerships occupy the next and the "modern" planets occupy the outermost wheel, according to the sign most favoured by modern astrologers (though this is by no means a true "rulership" according to the tradition). A planet is said to rule a sign when it is placed in the sign most sympathetic to its positive vibrations. Traditionally, there are six solar and six lunar signs, the solar counted onward from Leo, the house of the Sun, with the lunar counted backward from the Moon's home in Cancer. Each of the visible planets except the Sun and Moon has two houses (a solar and a lunar) according to the order of their revolutions. The modern planets have no place in the traditional scheme of rulership, as this would destroy the harmony of the system. Selected asteroids are being used by some astrologers, notably Ceres (now classed by the IAU as a "dwarf planet"). Other planetoids have been recently discovered beyond Pluto and modern astrologers are currently trying to determine their most favoured signs.